A fruit, berry and herb-filled food form vitamin C supplement for immune support and vitality. Derived from some of nature’s richest sources of this essential vitamin and antioxidant acerola cherries, rosehips, blackcurrants, parsley leaf and elderberries. 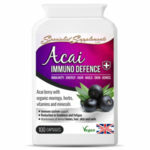 A concentrated food based vitamin C supplement derived from some of nature’s richest sources of this essential vitamin and antioxidant: Acerola cherries, rosehips, blackcurrants, parsley leaf and elderberries. Packed with antioxidants, vitamins, minerals, bioflavonoids, pectins, essential oils, lycopene, carotenoids, plant sterols, catechins, polyphenolics and many other phyto-nutrients, NaturaC is gentle and non-acidic – no artificial vitamin C (ascorbic acid). Why take Food Form Vitamin C? Per capsule: Vitamin C (from food form acerola cherry) - 125mg Also provides: Acerola cherry: 25% vitamin C - 500mg Blackcurrant (from extract) - 108mg Rosehip (from extract) - 108mg Parsley leaf powder - 50mg Elderberry extract (30% polyphenols) - 7mg Contains NO added: artificial colours, flavourings, preservatives, dairy products, gluten, lactose, soya, sugar, wheat or yeast. Suitable for vegetarians and vegans. Take at least 1 capsule each day. 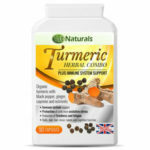 Take up to 3 capsules if undergoing stressful activity and if needing faster health recovery. 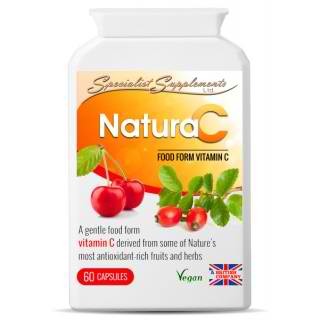 Be the first to review “Food Form Organic Vitamin C” Click here to cancel reply.